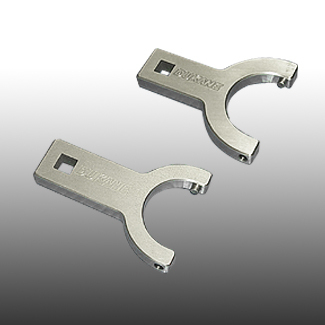 Diameter 1.00" 1.125" 1.40" 1.50" 1.812" 2.00"
This is a "Y" shaped stainless steel attachment having a semicircular surface and pin to grip round tooling (select diameter below) at the spanner holes and a 3/8" square drive hole for a torque wrench (the Sears Craftsman model works very well). This item is attached to the torque wrench at a 90 degree angle to the handle, and then used to tighten stack joints to a precise torque value. This is most appropriate for high gain stacks running in continuous-duty or high-duty-cycle high-volume production.